Everybody enjoys the occasional game of bingo and we are no exception; if the spinning reels are starting to make your eyes hurt then it does us all good to try something else. 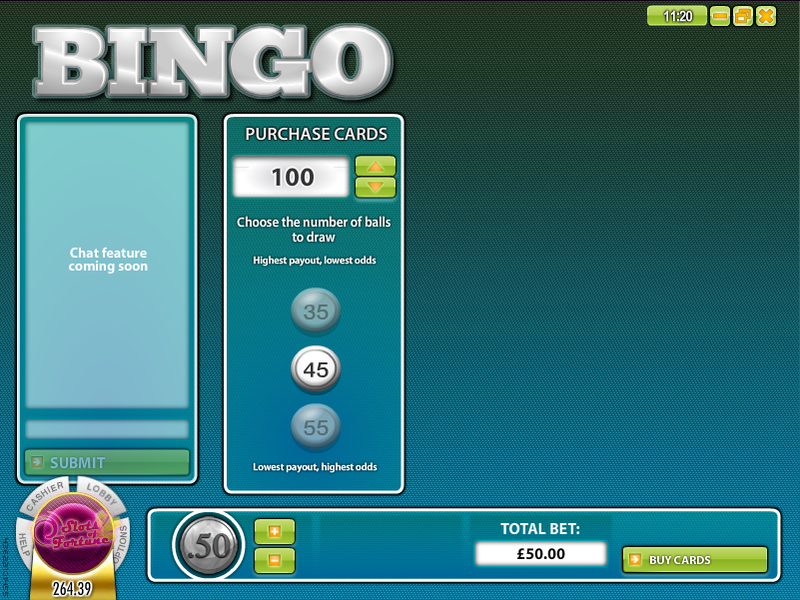 Not dissimilar to Keno, Bingo is a lottery-type game in which you must mark off numbers on one or more game cards in the hope that when the balls are drawn they will match your choices. How Many Balls To Draw – 35, 45 or 55. If you draw a greater number of balls the chances of a win are larger but the payouts will be proportionately lower. Note that the maximum total stake is £50 so you can’t max out both your game cards and your coin value. Once you’ve made your choices it’s time to click the ‘Buy Cards’ button and get the game underway. 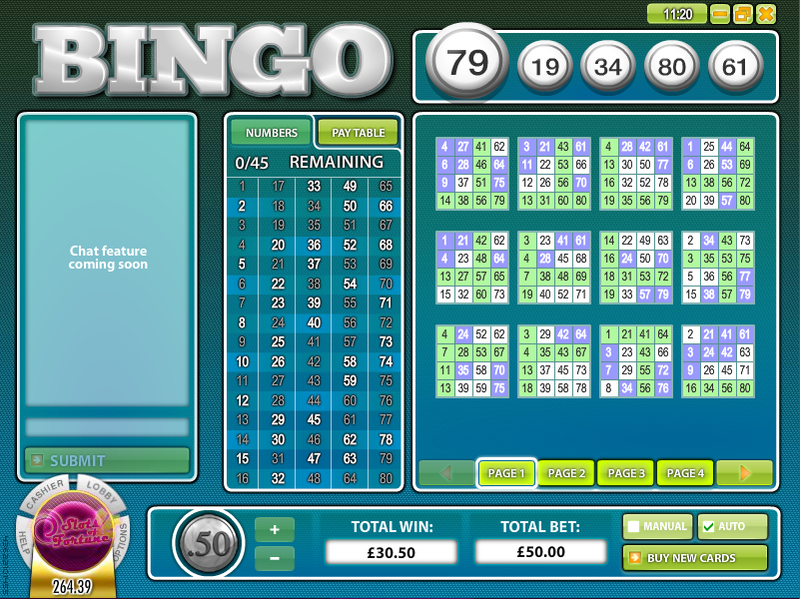 On the next screen you will see your selected game cards on the right hand side with the number table in the middle. On the left is a ‘chat’ feature for the more sociable. By default things will get underway automatically so the balls will be drawn and any matching numbers marked off on the game cards. Hopefully you will see the patterns gradually form on the cards and your total win increase. If you are playing with enough cards to warrant more than one page (as in our video above), the ones closest to a win will find their way to the top so you can always see what’s just about to win. When the round is over you will be paid out and then have the chance to go back to the card purchase screen again. We prefer this slightly more involved version over Bingo 30 Ball because there are more chances to make winning patterns (although your likely return will remain the same). It’s a relaxing diversion from the slots.